Dennise and I are friends since 2011 when she was still single, and I was still in college. We met during a trip to Europe, and I automatically was drawn to her beautiful heart. She talked a lot about Jonathan, her forever sweetheart, who was waiting for her at home. 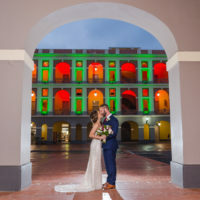 A while after we returned to Puerto Rico, she got engaged and eventually married the love of her life. Fast forward five years, and she told me about their plans for an anniversary session. They wanted to document this significant milestone doing what they love the most, spending time at home with their fur-baby Apollo, the cutest English bulldog ever. I also added a segment outdooors in order to capture the greenery I us during sessions. I visited their lovely home, greeted by Apollo, who was even more excited about the photos than Dennise & Jonathan. He was super curious about all the photo gear, which ended up in a lot of unexpected drool, but also the cutest photos. Their session was a rainy day, so we mostly stuck to the indoor part, only to come out for a while at the end, when the rain stopped. Thank you D&J for opening the doors of your beautiful casa for me, and to Apollo for all the cuddles. Cheering towards another 50 years of happy marriage! beautiful love stories for the past 8 years. Contact Cami here.